The competition does NOT stand up to this! a low quality machine that will underperform. cuts, no cut corners, only the best is good enough for you! 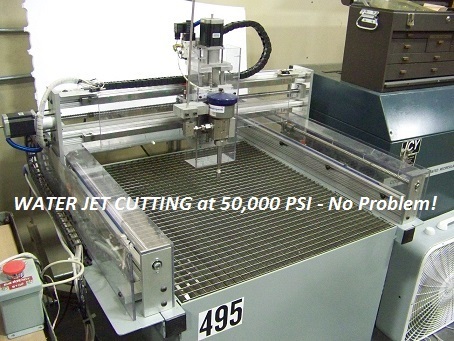 This CNC Router out performs others costing more than $13,000.00! 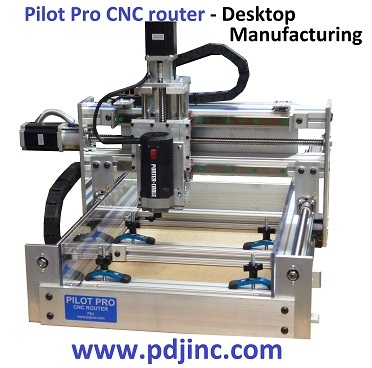 Why buy the Pilot Pro CNC Router? less shipping and handling. Ask for an RMA number before returning. CNCs are our passion; your success is our goal. Tell us where you want to go! Always - Linear Rails - Ball Screws - Best Design - Best Prices! Man Rides On Gantry Videos! on the Z axis for a 5 axis CNC. 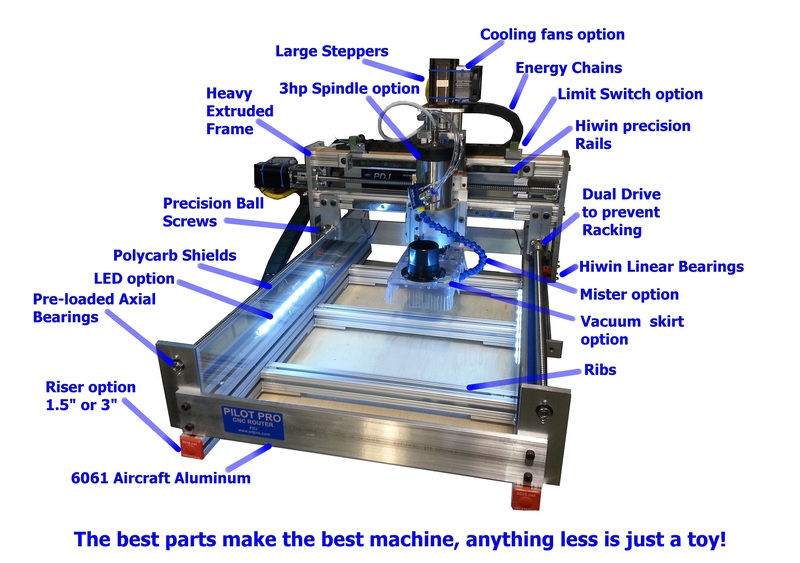 5 PRIME CNC MULTI-AXIS ROUTER DESIGN. Flange bearings, and more options on risers, table tops, clamping and so much more. (1,232 oz-in) for only $550 on new orders. NEMA 34 closed loop option is $1250. NEMA 24 closed loop option is $800. with the 5th axis option attached. spindle with ER20 collet, VFD power supply, and 80mm mount. Requires 220Vac. lasers are pre-assembled and tested. a Bosch Colt trim router. Let us know if you need a larger router mount or spindle. here. Here is a video of the new sensors on youtube. -> We now have custom T-Shirts! Check em out! 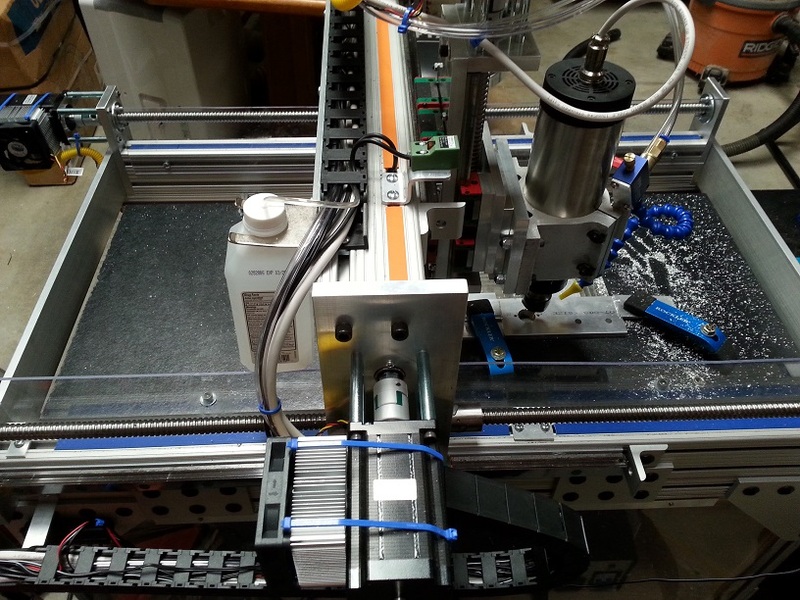 control the CNC machine movement. Have a look at our CNC parts page. -> We have a new 5th axis option shown here in this demonstration of the operation. USB interface. This makes the parallel port for control obsolete. 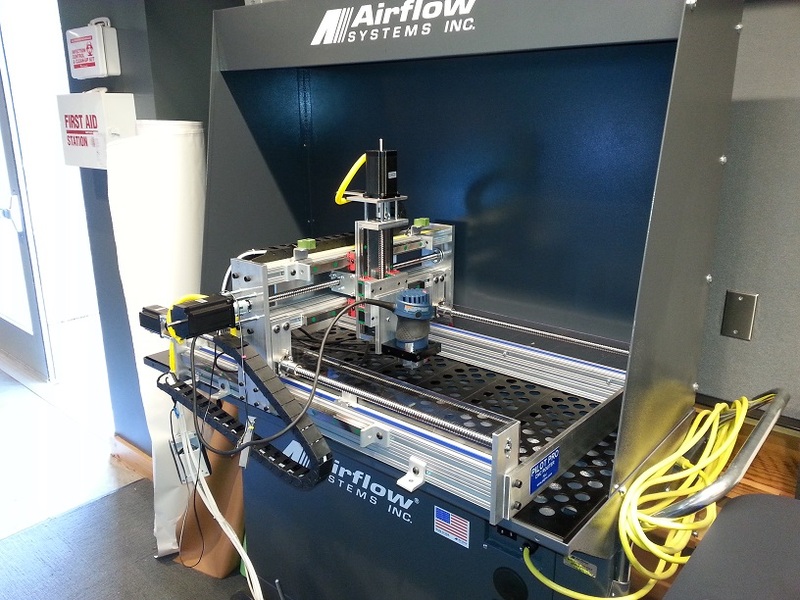 CNC router when not in use. Click here. -Surface face-milled stock and CNC cut for precise assembly. -Gantry clearance - ~7" but is completely adjustable. -Working area is unlimited In the length with indexing or tiling. -Rigid extruded frame with massive gantry. -Precision ground rails on all axes. (<+-50 µm / 300 mm). -Ball nuts are pre-loaded for no backlash. -Spindle mount - Bosch colt or Dewalt 611, or 3.5" body and spindle options. -4 NEMA 23 Stepper motors rated at 623 oz-in bipolar. 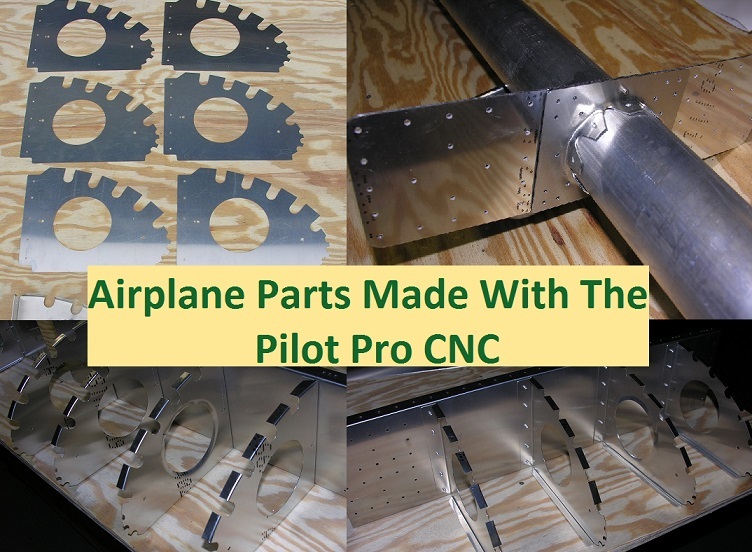 Pro CNC (The Pilot Pro CNC and Projects DVD). 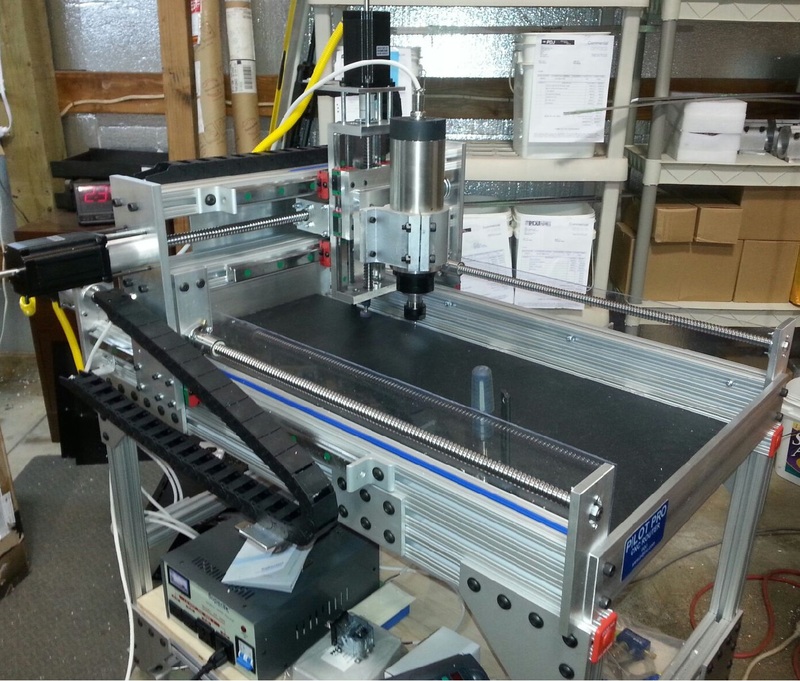 rapid 3D prototyping, laser, dispenser, test probes, camera, etc. -Computer requirements - any PC running Windows. Spindles are rated for 220Vac at 2.2kW, 110V to 220V converters work great. cutter instead of ink. It's really simple. The setup is a computer, control box, and machine. there is a USB adapter. design, and last is the software to run or control the machine. CAD is a drafting tool or Drawing program. CAD stands for computer aided design. Once you have the drawing now it is time to generate the tool paths. 3D stuff you need separate programs for CAD and CAM. data is mostly X, Y, Z coordinates just like graph paper or the Cartesian system. The 3 or more axes require parallel data and normally the parallel port is used. This is required for simultaneous movement. parallel port is not available. this application. They are accurate yet simple, powerful, and affordable. plate for accuracy, and hardened steel for massive load handling capabilities. design standards, Same everything you find in a quality machine shop. screw, motor coupling, rod bearings, acme lead nutz, plastic and wood parts, etc. These designs are designed for minimum performance and maximum profit. do you go for assistance? The difference between plate, architectural, and structural aluminum is important. by the suppliers as the other alloys, but this stuff is what you need for this job. expert after your first project. or motor size will only change torque. plasma, etc. The Pilot is so well designed that it handles all these jobs and more. 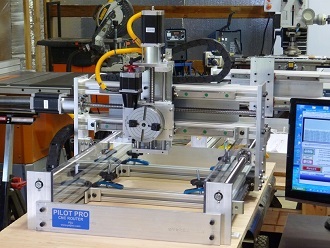 machine, the Pilot Pro CNC. Want to see our price list - Just Click Here! Want more Information or quote - Just Click Here!